The past, present and future of the X-Men collide in this 50th Anniversary event crossover! When investigating a new mutant, something truly horrible happens to the All-New X-Men that shakes time and space to its core. This is so dire that X-Men come from THE FUTURE with a message: THE ALL-NEW X-MEN MUST RETURN TO THE PAST! The ten-part crossover starts here with superstars BRIAN MICHAEL BENDIS and FRANK CHO! In the future Magik sees the future X-men batting sentinels. In the present a new mutant is activated and Kitty takes the original five into the field to deal with it. Sentinels attack and they go on the defensive. Cyclops Uncanny X-men come to their aid but young Cyclops is killed while defending young Jean Grey. His death almost alters time but Christopher Muse manages to resurrect him in time. This forces the reality of Best’s stupidity to the fore and the Wolverine team of X-men makes earnest pans to send them back to their own time. The original four object but then the X-men which Magik saw during the opening arrive in the present. I enjoyed the art by Stuart Immonen, Frank Cho and Wade Von Grawbadger. This issue has the future X-men in pink and red, the present day X-men in blue and the original X-men in full color. 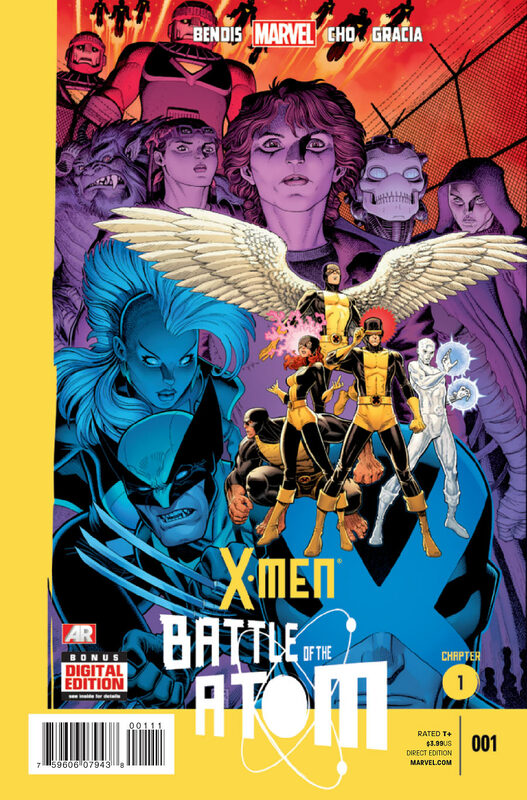 The X-men Battle of the Atom logo is emblazed at the bottom with a yellow ‘L’ shape on the left. I like the cover! I also liked the illustration of Jean and Scott as star crossed lovers, despite knowing what comes next; Young Cyclops and Jean can’t help but be drawn together. Talk about determinism and destiny! My biggest problem with this issue was the fact that young Scott died briefly causing older Scott to briefly cease to exist. Now following X-men logic that would have irrevocably fractured time (which would have been more fun to see than this crossover). Scott would never have been able to subdue Phoenix on the moon and Dark Phoenix would have destroyed earth if not the universe. Even if that was averted Scott’s death would have left mutants extinct following M-Day where he single handedly forged the remaining mutants into the mighty mutant Utopia. Without Scott, Cable ceases to exist so X-force is never formed, without Scott and Cable Hope never survives etc etc. You get the point there is a bit of flippancy where this death was concerned that pulled me out of the story in a major way. I’m sure it will do the same to a great many others. It’s also about damn time the modern day X-men realize the gravity of what Beast was allowed to do back in All New X-men #1. These are not alternate timeline versions of the X-men these are the literal originals, even one death changes everything! It’s good that was finally acknowledged. Bendis can do no wrong!